I LOVED Miracle Man, Book I, so I was very eager to begin The Austin Paradox, Book II, and I did, immediately. It’s a story of a superhero, but not one endowed with magical powers. He has a mind, a level of genius, never seen before. This is where we find Robert James Austin’s mindset as we embark on a mission to save more lives. There is a force of negativity and destruction in the universe. Highly efficient and infinitely resourceful, it empowers and leads. It gives diseases their resiliency, their tenacity, their propensity to reinvent themselves, resist treatments, regenerate and defensively mutate. It propels them. Christine, his wife, just wants a normal life, and now she has it…or does she? William R Leibowitz’s novels have a ring of truth to them, when dealing with Big Pharma and the government. So much of what he writes makes me angry, disgusted, and feeling helpless to do anything about it. I love when an author’s writing brings forth emotions that, at times, seem to overwhelm me. And if these books don’t open your eyes and scare the crap out of you, I don’t know what will. I have dealt with the affects of the ‘don’t cure the disease, just treat the symptoms’, mentality of those who want more, more money, more control, more….How about you? The main story, though, is about Robert James Austin and his desire to right the wrongs, all while fighting his personal demons. Robert believes that things should change and wants to help do it, by finding cures and making them accessible to everyone, not just those who can afford it. Man, oh man, if only his cures were real. The Austin Pardox is different from The Miracle Man, but we are still learning about his genius, or now, it is his lack of it. His life is still in danger from himself, but also from outside forces who want him gone. The book may be different, but it is still just as intense. A biological weapon, an apocalyptic Islamic caliphate…I wonder how everything will come together. I fear for the entire planet. I know this is fiction, but I feel it could become all too real. Can we look at William R Leibowitz’s series as a warning? Think about it. Who decides who lives and who dies? Who do you trust? The Austin Paradox left me hopeful and pissed off for The Miracle Man. I didn’t rate this as high as The Miracle Man. It was a bit different, but I wonder, was it my mood? Did I get dogged down in the details? I wonder if, after reading The Miracle Man, I found The Austin Paradox more predictable. I don’t know, but I find the series to be a special series, and I would highly recommend it to everyone! 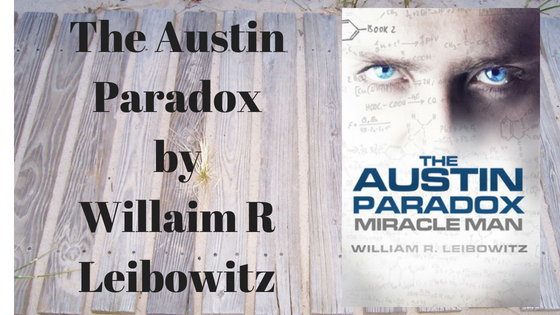 I voluntarily reviewed a free copy of The Austin Paradox by William R Liebowitz.